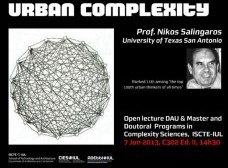 Lecture is part of Master and Doutoral Programs in Complexity Sciences, at the Instituto Universitário de Lisboa. Niko Salingrados is one of the most important theoricals in the architecture field. His work, such as "Principles of Urban Structure" and "A theory of Architecture" are must-reads for those interested in a new aproach concerninf built enviroment.